The sound of a cello, double bass or harp is carriedthrough contact with the surface. Presenting for the first time a podium, which has been constructed after the principles of a stringed instrument: Running under the front part ofthe SoundPodium 's top is a bass - bar which carries the vibrations originatingfrom the spike. 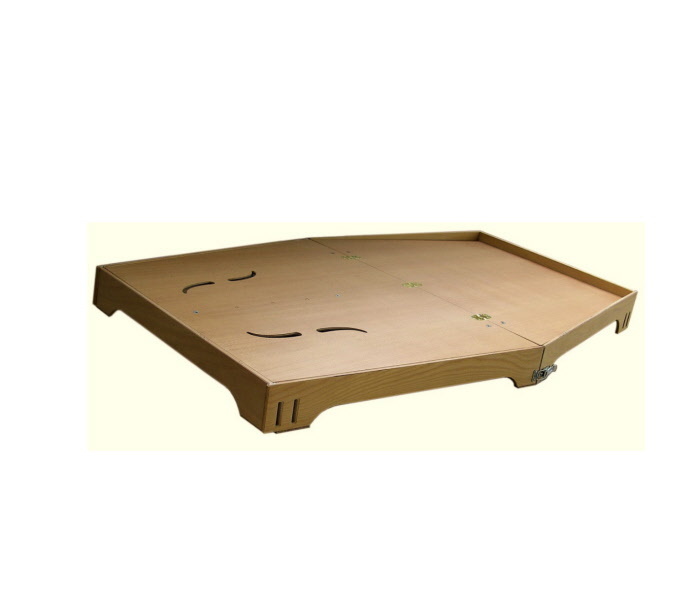 The top of the SoundPodiumis constructed of high-quality beech wood and is, like a stringed instrument,provided with F-holes. The entire podium is a foldable package, which hasa depth of only seven cm. The SoundPodium reinforces the natural overtones of the instrumentin contrast to the often reduced spectrum of a one-dimensional surface! The KlangPodium (sound podium in english) was patented by Reimund Korupp in 1996. David Geringas, after his recital at the "Musikvereinssaal"in Vienna: "The best sound ever." Prof. Tobias Kühne, Musikhochschule Wien, Teacher of Heinrich Schiff: "The large SoundPodium has been received well and is a great success in my class. With the construction of the SoundPodium you have served the needs of a great number of Cellists ..."
Prof. David Strange, Royal Academy of Music, London: "We are delighted with the SoundPodium , and students borrow it whenever they have a concert." Mischa Maisky: "Thank you very much for a wonderful Invention!" Mstislav Rostropowitsch: "Not only I, but all my colleagues would be very happy, if all the concert-halls had such a SoundPodium."